March of the Penguins, by pixie_bebe. I had no idea so many zoos had gay penguins. While googling for a picture I could use, I saw that in addition to China, at the very least, US and Germany have gay penguins. That’s not even counting the various state/regional zoos in the countries. Penguins caught stealing eggs from straight couples in an attempt to become fathers have been given their own to look after following protests. Zoo keepers moved the male birds away from the rest of the penguins to avoid problems as hatching season approaches. 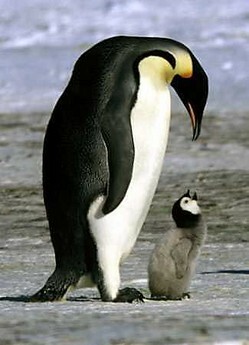 But angry visitors to Polar Land in China complained it was not fair for the males to stop becoming surrogate fathers. Following the protests, zookeepers gave the pair two eggs laid by an inexperienced first-time mother. “They’ve turned out to be the best parents in the whole zoo,” on zoo keeper said. Despite being gay, it is understood the three-year-old male birds are still driven by an urge to be fathers. via Gay penguins given own eggs to care for – Yahoo!7 News.